Ben and Darlene Sexton are pictured at their Old Days Vintage Campers site off Blue Ribbon Road in the Rocky Fork Lake area. The plan was to leisurely restore the vintage campers he’s fond of until he retired years down the road, then start renting them out. But when Ben Sexton got laid off and some things fell in place, the plan took a turn. Old Days Vintage Campers Ltd. opened on Memorial Day weekend near South Beach in the Rocky Fork Lake area. It has a small dwelling and two fully furnished vintage campers for rent overlooking Rocky Fork Lake, plus a more primitive “Deercamp Cabin” for rent at the eastern edge of Hillsboro. There are plans to continue with the original goal of a fleet of rentable vintage campers that would be pulled to Rocky Fork and possibly elsewhere. It all started with a hobby of collecting and restoring vintage campers. Sexton said that after he was laid off God guided him toward the new business. First, Sexton ran across a flea market booth selling old camper parts still in their original packaging. Then he discovered the father of the person selling the parts had owned an RV parts and repair business. Sexton ended up buying all the parts. Then, when he wasn’t really looking, he stumbled across a property for sale that overlooks the South Beach area at Rocky Fork. Before he knew it he was on the path to a new career. Starting a new business was a little more complicated than he imagined though, so Sexton sought out the Highland County commissioners, who put him in touch with Pete Pence, enterprise facilitator for Grow! Highland County. Sexton said Grow! Highland County helped him get a website and other social media platforms up and running, then put him in touch with its resource board. That’s when he learned about things he never thought of like different kinds of insurance, an accountant and more. He said resource board members Brad and Melissa Elmore were invaluable. “They took us in, fostered us, and told us what we needed to get things going,” Sexton said. Pence said Sexton was a little farther along in the process of starting a business than many who seek help from Grow! Highland County. When a client comes to Grow! Highland County, Pence said there are three main areas of focus: product/service, financing, and marketing. “We evaluate where the weaknesses might be and then try to formulate a plan to help them in their weaker areas,” Pence said. That’s where the resource board comes in. Pence said the board members are experts in different areas and a prospective business owner is paired with the experts that can help them most. He said they help the owner develop a comprehensive business plan, provide technical assistance like building a website and getting other social media platforms up and running, and help with legal contract types of questions. Anyone interested can contact Pence at 937-403-1488 or pete_pence@yahoo.com. “We’ll set up an initial meeting, sit down, and find out where they’re at and what their next steps should be,” Pence said. 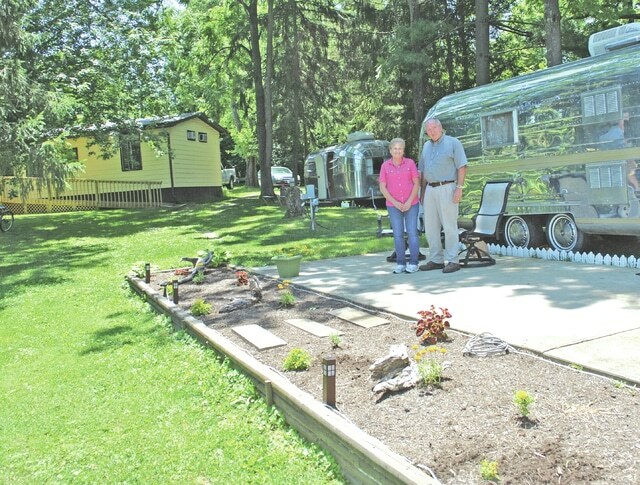 A Kettering native who moved to the Hillsboro area in 1976, Sexton said his love of old campers and Rocky Fork Lake comes from the fond memories he has of his parents taking him camping at the lake when he was young. He said the dwelling at his rental site is a building that was built in pieces at Wright-Patterson Air Force Base, then brought to Rocky Fork Lake and assembled to house the men who built the lake. The dwelling and campers at the lake come completely furnished with everything from linens and full electric to firewood and bicycles. For more information call 937-402-8329 or visit www.olddaysvintagecamperrentals.com.